Like many of my high school term papers, this post is about two weeks late. My timing isn’t great, but recent discussion about Chreasters has kept this topic is on my mind. We joke about Chreasters, those who show up for church on Christmas and Easter. A recent Christian Post article about how to keep them coming back gave some ideas as to how to deal with a surge of people who decide to visit church on Easter. While Christmas and Easter are two seasons where the church is more likely to encounter visitors, we should be prepared to welcome visitors on any Sunday throughout the year. The article makes the point that we should not rely on gimmicks to get visitors interested in coming back to the church. We should be prepared to minister to those who are curious or those who are brought to church by a family member. If we are relying on gimmicks and entertainment, eventually we will run out of stuff to keep them interested. So caged lions and special music are not the answer. As I see it, the reason that people do not attend church is because they do not perceive a need for it. They have not yet considered the big questions in life, or they have considered them and do not see a need for God to be a factor in determining their response to those questions. Church is not a priority because there is no perceived benefit. When I read the gospels, I see that Jesus often raised questions to get his hearers to consider ideas that were previously ignored. In John 4:16, Jesus suggested to a woman that she call her husband to the well. This led to a discussion of the woman’s marital history and her need for the Messiah. One chapter earlier, Jesus told a Pharisee that he must be born again. Jesus cut right to the heart. In both cases Jesus challenged both the object and the means of worship. We don’t need church, we need Jesus. Church is a place where we should see Jesus in others and be encouraged in our own relationship with Him. 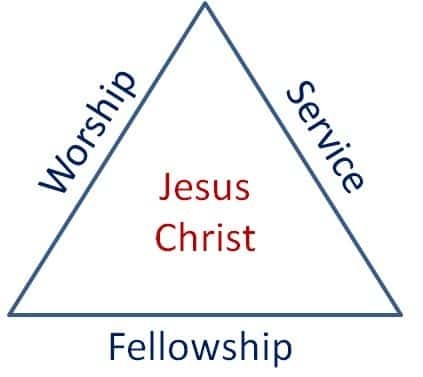 Attending church is a need for me, but it is a secondary need, my primary need is for Jesus. We must challenge visitors toward an eternal perspective. We must, like Jesus, bring people face-to-face with their ultimate needs. We have to offer more than coping skills. As the article points out, there are things we can do to make guests feel welcome and comfortable. Ed Stetzer reminds us in the article that it is a little like getting ready for house guests. When we have house guests, we tell them where the towels are, which bathroom to use and all of the other information required to make them comfortable. We should do the same at church. When guests see members walking around with coffee cups, it would be a good thing to show visitors where to get coffee. Having a clearly identified place for them to ask questions is also helpful. The goal in all of this is to remove barriers that prevent people from hearing the good news of Jesus Christ. On Christmas and Easter, the church should be doing what it should be doing every Sunday which is point people to Jesus as their primary need. Visitors don’t need the music to be perfect. Not every sermon is going to be a pinnacle of oratory. Visitors will encounter flawed people because that is what we are. But they should encounter flawed people who have learned how to love and who radiate the joy that can be found in Christ. If people see Jesus in us, if they hear Jesus proclaimed in the sermon, if they hear Jesus worshiped in the music, God can use that visit to stir up their hearts to recognize their hunger that only Jesus can fill. People don’t need church, they need Jesus. Church is the delivery vehicle, not the cargo. If we are honest, the fact that we are not moral train wrecks has to do with God’s grace than our ability to live out the Christian life. So why not extend that same grace to others? Grace combined with even a modicum of mercy will have a powerful effect. Jesus’ ye is easy and the burden light. If the burden is not light, if service is difficult, then I need to consider that the ye is not Jesus’ ye. Joseph learned that even though his brothers were evil toward him, God remained in control and even the evil coudl be used by God for good. God has called us to faithfulness and to leave the results in his hands. King Saul provides an example of one who did not understand this.